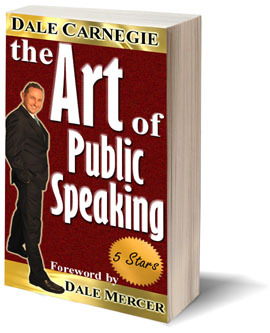 Easy To Use Public Speaking Course"
"Do you want to know how to prepare and present with persuasion...even if you've never presented before? I can show you how using the same proven step-by-step methods I have been using for years..."
I'm writing this today because I don't want you to suffer anymore through the anxiety of preparing and delivering your presentations again. In fact, I want you to get excited about the prospect of becoming an excellent public speaker. WHY? Because believe it or not, I used to be a terrible public speaker. If fact, it all started in 1st grade school. Look back over my report cards in school and they all say the same thing; "Dale lacks confidence in presenting to his schoolmates"; "Dale is a nervous child"...the list goes on. So, to be on stage in front of an audience is kind of ironic. The reason I tell you the above is I don't want you to think that you can't become an excellent public speaker, because you can and I'll prove it to you. Afterall, I've had the sleepless nights and trial and tribulations associated with just the thought of presenting, but I promise you that it doesn't have to be this way. I just thought I'd let you know that I listened to your program and I LOVED IT! I just wanted to send you a video to let you know some of things that have happened since watching your videos and listening to your audio program. You don't know me but I'm actually a business coach; I've done allot of speaking over the years. I've maybe 150-170 presentations on the subject of business and never had any formal training. But someone told me about your program so I got it and I LOVE IT! What I have managed to learn in the ability to use diction enunciation and actually structure my presentations so they flow a little bit better rather than just off the cuff. And you wouldn't believe it but I've actually created my own audio program with what I've learn't from your 'Step Up and Speak' program. So, thanks Dale, it been phenomenal to learn the process to actually lay that as a track and become a better speaker. I recommend Step Up and Speak to anybody whether they be a starting out speaker or an accomplished speaker and they speak on the circuit because what it does is it refines you. It cuts those dodgy edges off your presentation skills and refines you as a speaker. Whether you're new or experienced, you'll learn allot from Dale's 'Step Up and Speak' program to refine you as a speaker. Dale, just wanted to let you know; mate I love it; I recommend it to everybody. And if you have anyone who wants to talk to me, just send them through. 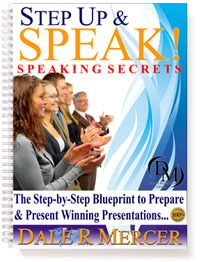 "Step Up & Speak - The Step-by-Step Blueprint to Prepare and Present Winning Presentations". I have really have to say; WOW! I thought I knew alot about speaking since I'm a professional speaker and business coach, but I've learned so much since going through your program. I LOVED the secret which is one of my favorites in Session 5 about using more power words in my presentations and I'm putting that to use right away. And I'm also really excited about using the 'Chunking Method'. You'd think I'd know about this by know being a seasoned professional...but I didn't and I need help with extemporaneous speaking. So I'm using the method that you go into great detail in session 10 right away. I've spoken to small groups; I've spoken to auditorium sized venues and this method will definitely increase my presentation skills tremendously. So, I wanted to tell you thank you so much, especially sharing your step-by-step blueprint. It makes all of the content you give so easy to digest and implement. And your program helped me to become a better speaker just be implementing, many, many of these ideas. I think it will help anyone to give better presentations whether they're are new to the speaking arena or they are a seasoned veteran like me. So, I have to honestly say...YOU'RE NOT CHARGING ENOUGH:-)! I thought you gave tremendously value for the investment. Thank you so much! If 9 Out Of 10 People Are Not Buying Your Products, Ideas And Concepts...It's You're Fault And It's Costing You BIG Time! * Do you feel ineffective as a presenter? - Are you sick with nervousness and anxiety about speaking to a group? - Do you fear that you'll forget what you're saying and lose your audience? - Have you sat staring at your BLANK computer screen wondering 'where' to start and 'what' to write? - Do you find yourself presenting with dry mouth or gasping for breath while you speak? - Do you feel like you're not making sense when you speak? If you've answered yes, then know this...it's costing YOU...BIG TIME! I just thought I'd drop you a quick video email because I wanted to say thank you very much for your excellent Step Up and Speak audio and video series which I was lucky enough to get hold of. And since doing the course, my video and presentation skills are getting much, much better. Most of my work is doing presentation skills for the web and since taking your course, I've noticed that people are leaving comments on my blog and on my videos saying how much my presentation skills have improved. What they don't know is I have been working my way slowly through your course over the last few months and I have been incorporating many of the ideas into my presentations. In the past, I've always lacked confidence when speaking; either to a live audience or to a video camera, but I can feel that my confidence is growing now and I don't have to worry as much before the presentations. I actually enjoyed the whole of the Step Up and Speak course and I find myself referring back to it fairly often. There is a couple of things I personally found really useful; which I guess I should have been using all along. The first one was: How to prepare and how to create an outline for my speech. And the other was how to keep the audience attention for longer through using hand gestures, using props and changing my voice tone and speed. So, thanks again Dale...keep up the great work and hopefully one day I will be speaking on stage with you. - What if...you could speak in public without the fear of forgetting your thoughts? HIGH the whole time you're speaking? - What if...you could finish your presentation knowing that you absolutely nailed it! - What if...I showed you exactly how to use mental triggers to persuade your audience to your ideas! a step-by-step system you've always wished for. You don't have to worry anymore because this system has been created with you in mind. I teach the steps to solve this issue that you and thousands of people around the world are experiencing. There is no reason for you to experience the stress and anguish that you're going through. "Discover How Two College Students Use The System for Their Assignments and Business"
"I can do it!" Dale taught me how to prepare the right way. Even though I prepared my speech with notes, I didn't have to refer to them which made me more natural to my audience. 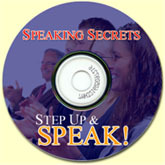 Step Up and Speak gave me the awareness of what to focus on when preparing and presenting my speeches. I found every session had points that were useful in making my talks more interesting and exciting for my listeners. I've also learnt how to make in fun for myself and how it doesn't have to be difficult. 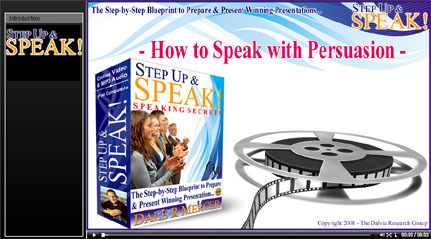 Dale took away the fear of speaking because I knew how to prepare step-by-step. I didn't need my notes because I was prepared and practiced. I highly recommend everyone get Step Up and Speak before their next presentation! "Most people have no idea of the giant capacity we can immediately command when we focus all our resources on mastering a single area of our lives." Discover the secrets of legally borrowing other people's stories for your presentations. The little secret for finding emotional POWER words in seconds...yes I said seconds! A Collection of Easy to Listen to Audio and Video Sessions that "Take You By The Hand" and Show You Exactly How To Prepare and Create Your Presentation from A-Z! Your First Session Will Begin TODAY! Please Note: Sound Quality is Reduced for the Web. The MP3 Audios are High Quality and Fully Downloadable for CD and IPod. is 'where to start'. Many become so overwhelmed at the thought of presenting that all logical and creative thought goes out the window. If you are new to the world of public speaking and presenting then this session is for you. sense to you and your audience. - In this Video lesson, you'll discover the listening patterns of your audience and how to keep them flying with you the WHOLE time you're presenting. When you know how people listen, you'll know exactly how to prepare your material and deliver your presentation. out of the palm of your hand. so they feel the way you want them to. Use words to persuade and move your listener emotionally. I'll show you my secret for finding POWER words you can use in literally seconds! perception of you and your message. and juice to your presentation that will stir emotion and motivate your listeners to action. I'll teach you my 3-Step Secret to making your presentation sound more powerful and influential. - In this video you'll learn what gestures you MUST avoid so as not to offend your listeners. How you can develop natural looking gestures that is appropriate to your material. - How you can use repetition correctly so your listeners remember you long after the presentation is over. Discover the powerful formula of three. Use it otherwise they won't remember your speech! The Step Up and Speak Action Workbook is a full color printable book which is worth it's weight in gold. You will find yourself constantly referring back to the 'How-To Sections' and the end of each lesson as a reminder of how to do a certain aspect of presentations. It contains optional step-by-step exercises you can do during or after each session. But Are You Sure This Will Work For Me? Absolutely! All you have to do is follow along with the step-by-step instructions I give you and follow the exercises in workbook and you'll be ready and confident in no time at all. The idea of speaking in public has always been a dreadful calling to me. The problem is so real that in fact even the so-called accomplished presenters often find themselves falling short of delivering their best performance, where public speaking is concerned. Now here comes the cavalry. Step Up and Speak! 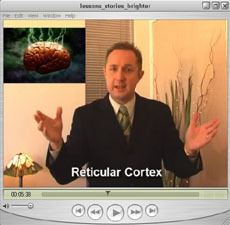 is a powerful interactive e-course that combines the art and science of delivering the winning speech and presentation. All the key elements in the course are structured so well and smooth that you will realize you're already at full speed even before you know it. In short, everything is packaged together in a silver platter, ready to blow you away. What I appreciate most about this program is that it is not merely a plain educational program, but Dale went great length to empower myself and start discovering the real talent hidden somewhere inside me, waiting to be unleashed. 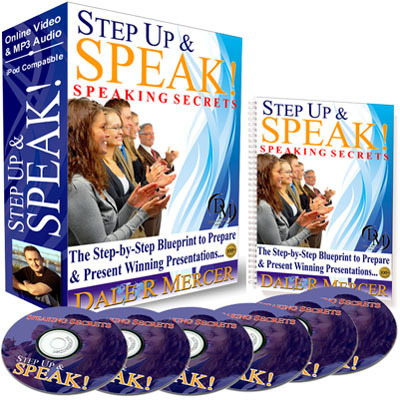 Regardless of your field, level, or which continent you come from, if you dare to experience life changing experience, come on board, get acquainted with Dale, and secure your copy of Step Up and Speak! NOW! "How to Speak and Present with Persuasion"
* What the difference is between Persuasion and Manipulation and why you should never manipulate. * How you can easily use little known "Mental Triggers" that can influence people to your ideas...even if you don't feel that confident. * Discover what triggers persuade people to get on board with your ideas, solutions and suggestions. These videos have never been released to the public by me...until now! And the best thing is, this is simple and easy to remember and implement. You'll look over my shoulder as I go online and show you where to research speech topics. * What topics never go out of style and how to find material on those topics. This screen-capture video with voice over allows you to "watch over my shoulder" as I surf online and show you some amazing easy-to-use tools that will make it simple to select your topics (if you don't have one) OR find an audience for your presentation. The Complete 425 page Classic. DALE CARNEGIE (1888-1955), a pioneer in public speaking and personality development, gained fame by teaching others how to become successful. His book How to Win Friends and Influence People (1936) has sold more than 10 million copies. He also founded the Dale Carnegie Institute for Effective Speaking and Human Relations, with branches all over the world. Could you speak and present on your own without Step Up and Speak? Sure you could, but why? Why should you go through all the trouble, trials and tribulations that I did? Let me make a pretty bold statement. In today's day and age for anyone to learn through trial and error is completely absurd. To add to that, especially, when you have someone right in front of you who has taken the time to lay it all out for you in a complete step-by-step format which is ready for you right now. and training you rightfully deserve. YES! 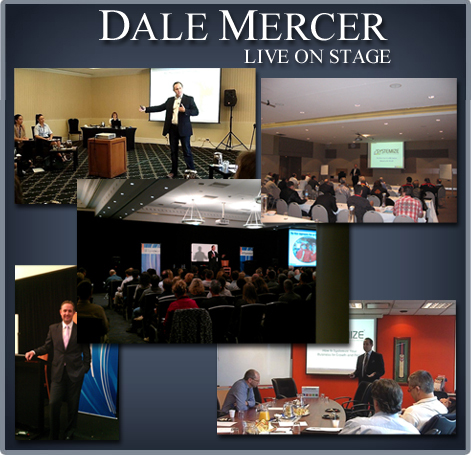 I want to learn the exact strategies and techniques which Dale Mercer uses to Prepare and Present Winning Presentations. Once your credit card is approved, you will be taken to a special download page where you will download the entire program along with your FREE Bonus Gifts. You will be able to download the entire program...right away. P.S. Order the Step Up and Speak System today and get started within 30mins. PO Box 784 Surfers Paradise, Queensland 4217 - Australia.